For those of us that are Mac users the OSX dashboard can be a real time saver. An earlier post titled, Digital Photoshop Color Aids, focused on useful color extensions available for Adobe Photoshop. 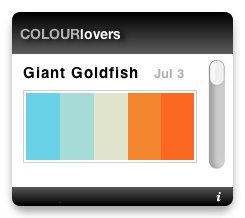 The information presented here features widgets that can also be very helpful in choosing and using color. And they are available without having to boot up an application. Some are standalone widgets while others connect to websites with information, trends and user color communities with worldwide-contributed color schemes. Color Theory is an online Color Scheme Generator used by illustrators, designers, and interior decorators. It’s an interactive color theory visualizer in the shape of a sphere. It also includes achromatic simulation. The sphere uses basic color theory in order to automatically provide you with visually appealing colors. . The extremely versatile color sphere operates in several modes including the standard ones like analogous, complementary, etc. and four, five and six color configurations. The color sphere can be set up for different human vision conditions such as protanopy (night blindness, tritanopy (color blindness), and several others. 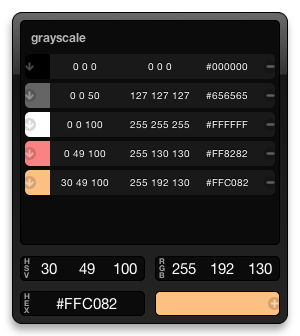 Chroma is an OS X Dashboard utility for converting colors between HSV, RGB, and HEX formats, including 256 integer, percentage, and floating point variations. Added colors can be saved to the swatch library, which can then be exported or imported via the system clipboard. Colors are displayed using RGB, HSV, and HEX values. 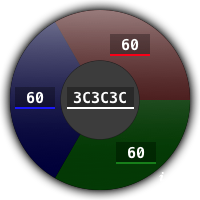 The RGB Converter is a simple dashboard widget to convert between RGB color values and HEX equivalents. For creative professionals, RGB Converter can manage individual components values or a comma-separated string of values to display a color by it’s RGB or HEX code. 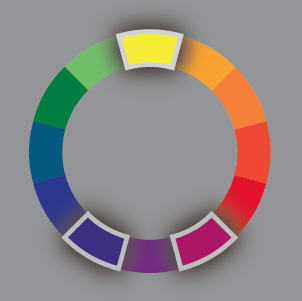 The wheel instantly updates the color of each component and the resultant color. Since it runs as an Apple Dashboard widget, it's quick and always at your fingertips. 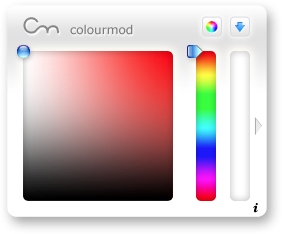 ColourMod is an extremely flexible color picker that allows for users to select any color that they want. Its appearance and function is very similar to the standard square field color pickers used in Adobe software, but it is a standalone widget. Fine adjustments can be made via text field inputs or by simply dragging the color sliders. ColourMod outputs and inputs Hex, RGB, CMYK, and HSV values and converts between the four. 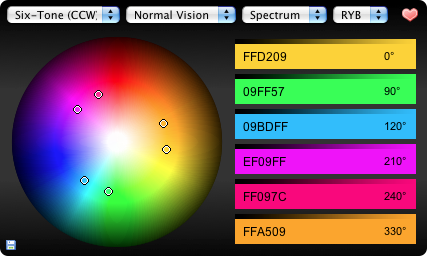 Targeted at developers, this dashboard widget uses HSL sliders and plain text fields to tweak colors. 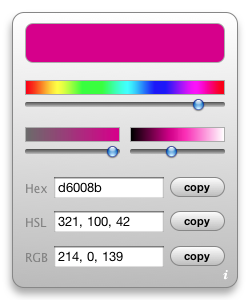 Clicking on a color field displays the HEX, RGB, or HSL number, which can be copied to the clipboard with a single click. HEX values can be displayed in full or abbreviated notation. Piker is perhaps the simplest and most compact widget that displays web-safe colors. The color preview field updates instantly when you place the selection arrow over one of the mini color fields. 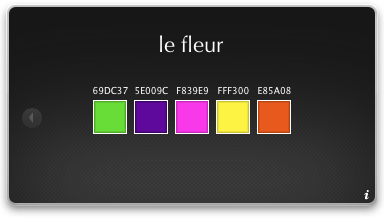 Clicking on a color field displays the hex number, which can be copied to the clipboard. ColorSafe is a dashboard widget that offers you a web-safe color picker. The display is all inclusive for the 216 color web-safe palette. ColorSafe was designed specifically for web artists, designers and developers that restrict there color choices to web-safe colors. The safe icon displays the color that the selection arrow hovers over. The HEX value is also displayed. Kuler is available as a dashboard widget from Adobe. Photoshop and Illustrator users should be familiar with Kuler, which is an extension in those programs. It’s a well-designed, very useful Web-based color picking app. The widget can access color schemes from the Kuler.com site to display. It’s possible to filter search the most downloaded, highest rated, and latest color schemes contributed by other users in the Kuler community. 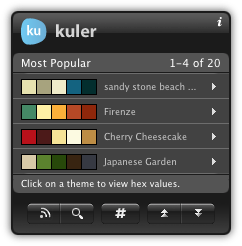 Kuler allows the user to search the tags to search for existing color palettes, each scheme in the widget provides a direct link to that scheme in Kuler, making it very easy to modify the scheme, which can be saved online at Kuler for future reference and sharing. One very nice advantage is the ability to create a color scheme in the widget, save it, and then access it through the Kuler extension in Photoshop, Illustrator, and other Adobe programs. ColorSchemer Galleria is a free dashboard widget that allows you to browse all of the schemes in the ColorSchemer Gallery. 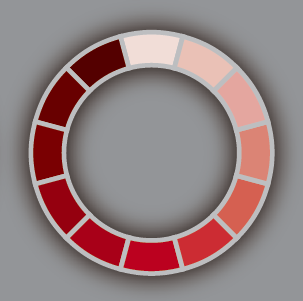 Like Kuler, the widget connects to the ColorSchemer community of color scheme contributors to the colorschemer.com website. Users can browse, search, and download from over a million color palettes right from the linked website. The Galleria widget displays each color scheme on an isolated black background, allowing viewers to get an optimal view of the colors. 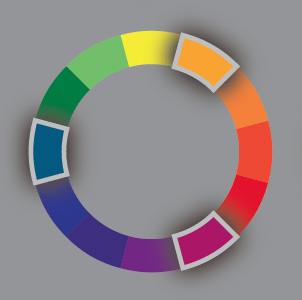 The COLOURlovers website is a resource that monitors and publishes color trends in use internationally. The dashboard widget displays color palettes and connects to the website. 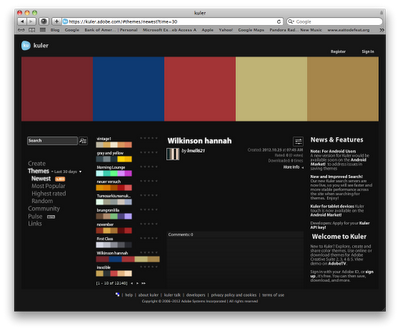 You can create a profile, add favorite palettes and colors, and add comments to posted colors. COLOURlovers gives users a place to compare color palettes, submit news, and read color related articles and interviews The information can be used in illustrations and designs for editorial publications, ad campaigns, product design, or in architectural specification. 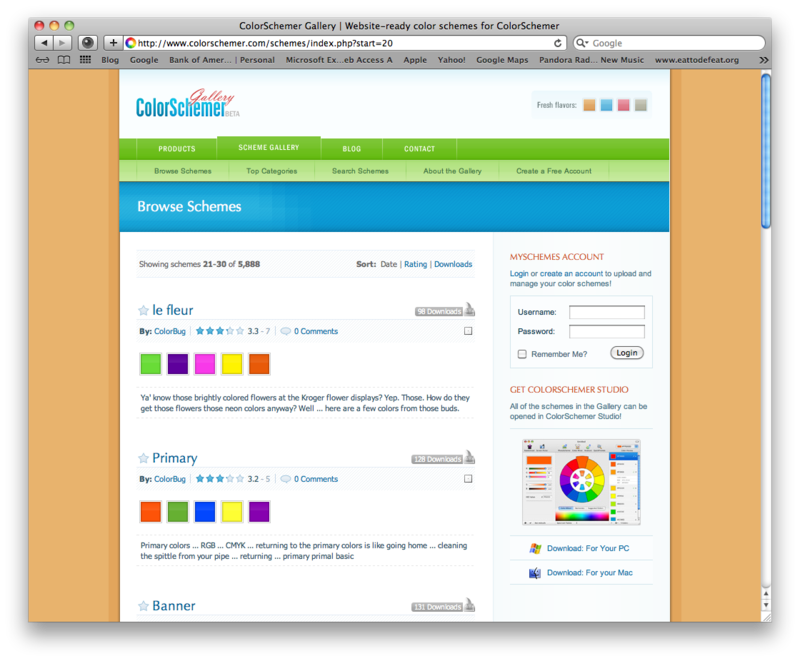 Once registering as a “colour lover” and you can submit colors and create color palettes. 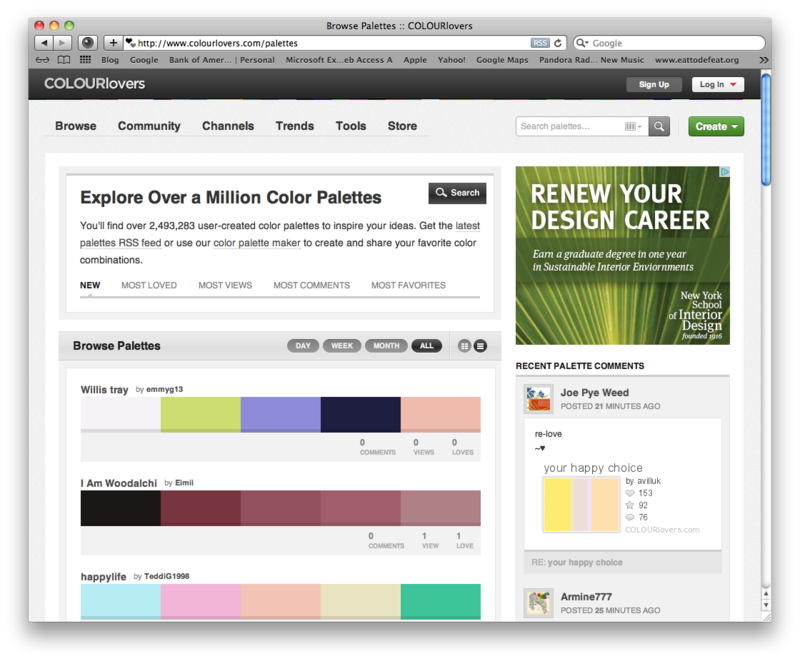 Searching for colors and palettes can be based on color names, numbers, and Pantone numbers. A color scheme is an arrangement of colors based upon a color system, in this case the color wheel, that is then applied to an illustration, design or work of art. Although most of us primarily work intuitively when it comes to making color choices, knowledge of color theory and an understanding of basic color principles can improve the appearance of an illustration. Understanding color combinations can help move an assignment along more quickly, especially when it comes to creating a coordinated series of images. Strangely enough, a place to begin may be to visualize your illustration by considering only values or achromatically. By considering values, compositional issues such as form definition, contrast, lighting and mood, can all be worked in to color selection, refinement and completion of an illustration. Shapes, silhouettes, and issues such as compositional tangents that may be overlooked in a full color image, can be easily considered. Color can be so overwhelmingly impressive and distracting that it is easy to shortchange the fundamentals of good composition. Arguably, the structural composition of your sketch will have more influence on a viewer’s aesthetic interest than will the color. An effective color scheme can attract attention to an image, describe a time or setting in an illustration, set a mood and atmosphere within an image, provide an organizational hierarchy to a composition, aid in the identity of an object, and enhance the overall effectiveness of an image narrative or concept. Color is the impression on the brain transmitted through the biological mechanisms in the human eye resulting from sensations caused by light. 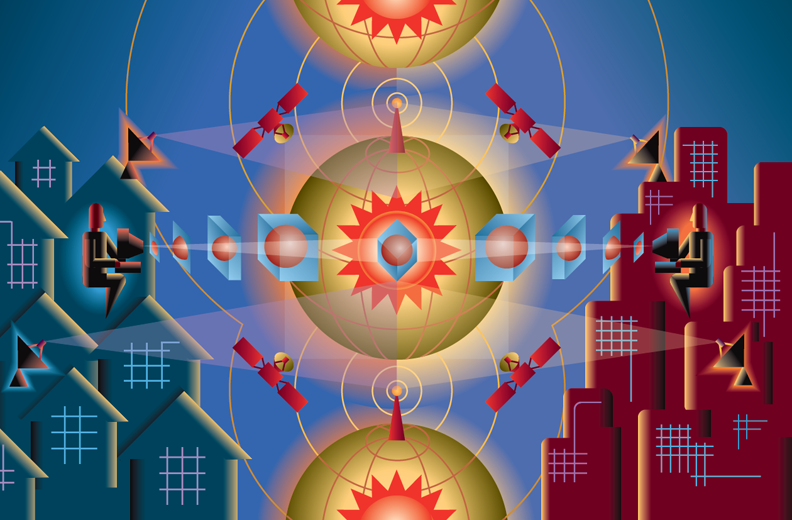 Visible light is wavelengths of electromagnetic radiation that can be perceived by the eye. The wavelength category of “visible light” is within the range of 380 to 740 nanometers (nm). Red light is from 625 to 740 nm, orange is from at 590 to 625 nm, yellow is from 565 to 590 nm, green is from 520 to 565 nm, cyan is from 500 to 520 nm, blue is from 435 to 500 nm, and finally violet is from 380 to 435 nm. Incidentally, a nanometer is a unit of length in the metric system equivalent to one billionth of a meter. The electromagnetic spectrum of wavelength categories includes radio waves, microwaves, infrared waves, x-ray waves, gamma rays, and ultraviolet waves. When light hits an object, electromagnetic wavelengths are reflected back to the eye. The eye senses the reflected wavelengths of light and perceives/sees them as color. Objects reflect and absorb wavelengths. When an object absorbs all wavelengths we see black, and when it reflects them we see white. The entire range of wavelengths reflected back to the eye produces the color spectrum. A primary color scheme consists of red, blue, and yellow. Primary colors are the basis for creating other color schemes. 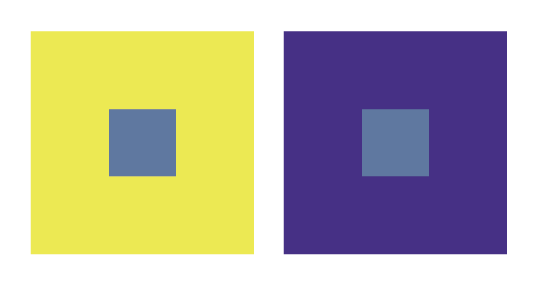 Combining non-primary colors cannot create primary colors. When two of the three primary colors are mixed together a secondary color is produced. 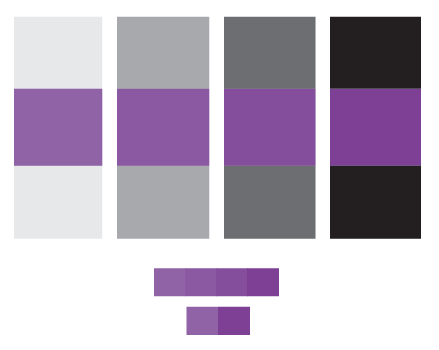 The three possible combinations result in the secondary colors of orange, green, and violet. 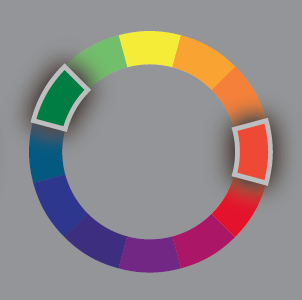 Part of the 12 color wheel system, tertiary colors are created by mixing one secondary and one primary color, e.g., mixing blue and violet to create blue-violet. These mixtures result in the creation of the six remaining colors of the color wheel. Tertiary colors all have hyphenated names, each name being a combination of a primary and secondary colors; yellow-orange, red-orange, red-violet, blue-violet, blue-green, and yellow-green. An achromatic color scheme is one that is colorless using only blacks, whites, and grays. 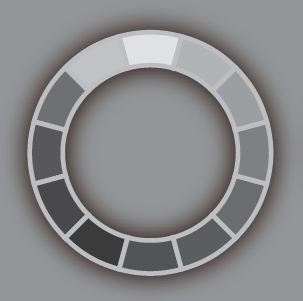 Achromatic colors have zero saturation and only neutral hue. 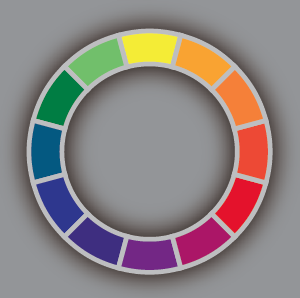 The color wheel translated into achromatic colors. A monochromatic color scheme is solely based on one color hue. A monochromatic color scheme can be one color, or an applied range of values based on one color, i.e., black and white can be used to darken and lighten the value of the color to create tints and shades. 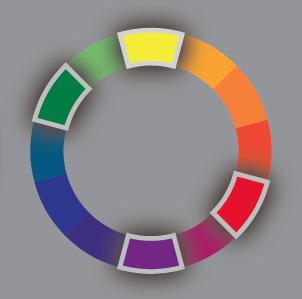 The color wheel translated into an example of monochromatic colors. A color scheme possessing or exhibiting two colors. The colors do not have to conform to a structured relationship such as a complimentary color scheme. 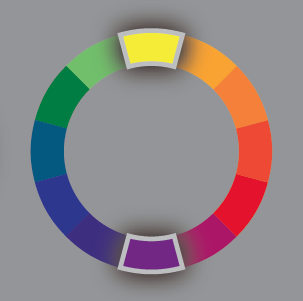 A diadic or diad color scheme uses two colors that are separated by one color on the color wheel. Examples would be red and orange, blue-violet and blue-green, red-violet and red-orange, etc. 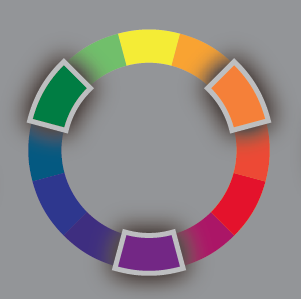 A color scheme using two colors that directly oppose one another on the color wheel. Yellow and purple, red and green, and blue and orange are all opposites and therefore complementary colors. A trichromatic color scheme consists of three colors. The term is often used to refer to the red, green, and blue color receptors in human vision. 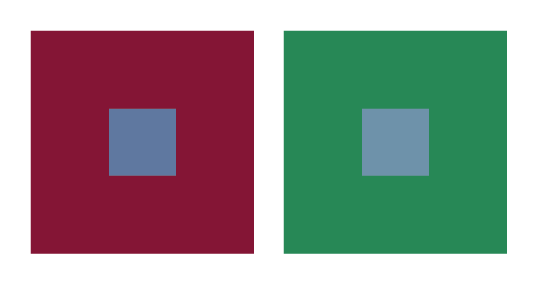 A color scheme using three colors in a fixed configuration where colors two and three are adjacent to the complement of the main color. Examples would be yellow, blue-violet, and red-violet; or red-violet, green, and yellow, etc. Example of split complementary color structure. 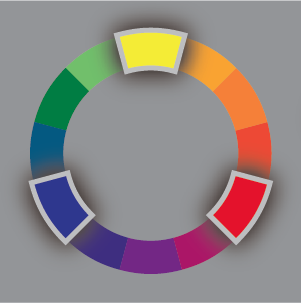 A triadic color scheme uses three colors that are equally spaced from each other on the color wheel. In addition to primary and secondary colors being triadic color schemes, many other combinations can also make up a triadic scheme; such as red-orange, red, and red violet; or yellow-green, blue-violet, and red-orange; etc. Example of a triadic color structure. A subset of a triadic color scheme, an analogous color scheme is any three adjacent primary, secondary, or tertiary colors on the color wheel. Because each color in an analogous scheme shares a mix color with its closest neighbor the scheme is also referred to as a harmonious color scheme. 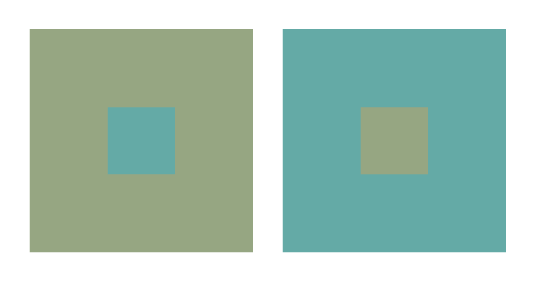 A color scheme using three colors in a fixed configuration where two colors are one space away from a main color rather than being adjacent. Examples would be yellow, orange and green; and red-violet; or red-violet, blue-violet, and red-orange, etc. Example of split analogous colors. 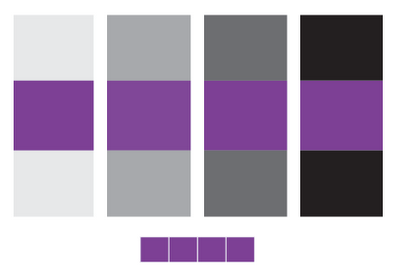 The tetradic or tetrad color scheme is system with four colors based on the use of two sets of complimentary colors. It is also called the quadratic, and the double complementary color scheme. The tetradic configuration results in a number of possible color combinations. Example of a tetradic color structure. Gradients and blends play a prominent part in the artwork produced by many digital illustrators, and ever since blending and gradient modes have been available there has been one persistent problem with their display and output. The problem is banding. Although banding can occur in raster-based software programs like Adobe Photoshop, banding is much more prevalent in vector-based programs like Adobe Illustrator. Banding is the visible appearance of marked steps of color within a gradient transition. It can be though of as seams within a supposedly seamless progression from one color to another. Banding can be quite pronounced or very subtle. It can occur in linear, radial, or customized shape blends and gradients. And it can happen both on computer displays and in print. Example of banding produced by a gradient. Banding is device resolution dependent. In other words, banding conforms to the device that is producing it, so a banded pattern that occurs in a specific gradient on a computer monitor, can have a different pattern when the very same gradient is output as a digital print. The best analogy I can think of to compare to banding is the medical condition diabetes. Once you get it you can manage it, and with certain treatments it may go into remission or appear to be unnoticeable, but it will never go away completely. In the digital world we call these treatments “workarounds”. Workarounds are ways to improve a situation in an indirect manner. I have tried many ways to deal with banding throughout successive updates in software, display and postscript technology. Here are some of them and their results. This works when it can be done, but it can’t always be done when a specific visual effect is needed in an illustration. I’ve found that there is no length formula to guarantee a perfectly smooth result every time. It all depends on the particular makeup of the colors used in the gradient. 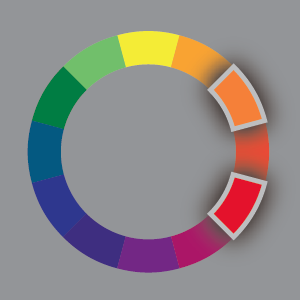 The gradient contrast is the percentage ratio between the starting and ending colors in the gradient. 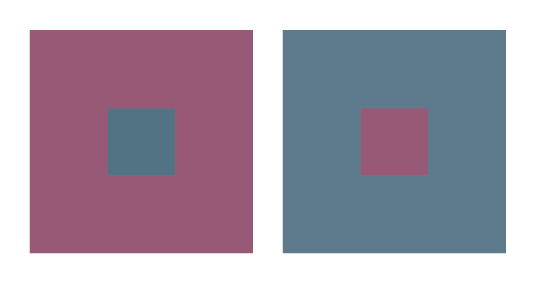 Again, this works when it can be done, but this could result in changing the desired color scheme in an illustration, and for the sake of a workaround this might not be desirable. Although this is offered as a workaround for banding, I haven’t experienced or found any consistent information about “banding proof” colors, or even about colors that are guaranteed to band. Of course there is the myth of Pantone Reflex Blue when it comes to bad colors; in CMYK (100C, 90M, 30Y, and 8K); in RGB (0R, 32G, and 159B); in Hex for the web (#003399). Reflex Blue has long been thought of as a cursed color, and it seems this has carried over to the digital world. In printing inks, Reflex Blue is one of the 14 Pantone base inks that are used to mix the other colors in the Pantone Matching System. Printing inks are real substances made of minerals and pigment, and there is validity to the fact that Reflex Blue is actually less stable and predictable to print with than the other Pantone base colors. However interesting this may be, it has no validity in the digital world, where there is no Reflex Blue pigment, and it doesn’t even exist in inkjet or process color printing. So the most likely candidate for "color guaranteed to band" is out of the running. Using CMYK can in some color combinations reduce banding. 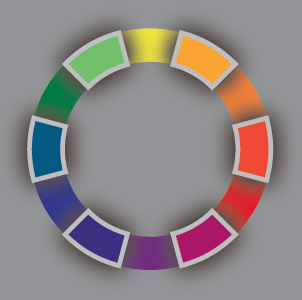 I have had success by creating colors that have some percentage of all of the CMYK colors. A purple that is primarily magenta and cyan but has a marginal amount of yellow and black will gradate better than a magenta/cyan purple. In other words, four channels blending over a distance will perform better than two. Now this solution may be a bit controversial, but it has worked for me, particularly when it comes to an aspect of banding I call “white cutoff”. 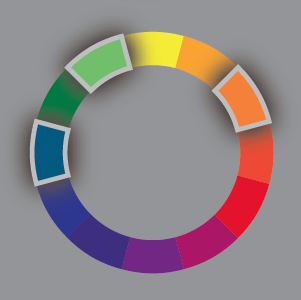 Essentially, rather than having a zero factor for any of the components of the colors used in a gradient, I enter a value of one or two percent. In most situations it is undetectable by the viewer, but I have found that it does smooth out a gradient toward the light end. White cutoff is the point where the output device makes the decision to stop dispensing ink or cuts off the color in a blend. Some output devices will cutoff one or more colors and continue on toward white with only one color. So for example, there will be a faint red haze at the point a colored blend becomes white. When this happens it can be quite conspicuous and absolutely ruin a print. Eliminating the zero percentage prevents this from occurring. This method involves creating a flat color or grey tone file in Photoshop, adding noise to it, saving it and then placing it into an Illustrator image as an overlay. 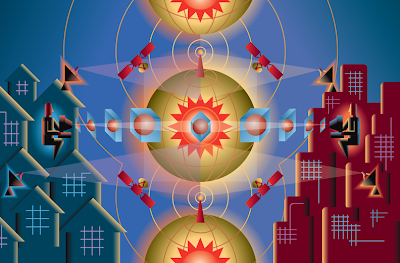 The downside to this technique is that it adds a raster element to a vector file, and however it is applied, either with a multiply or an overlay blend mode, it does alter the gradient below. Rasterizing a gradient component in Illustrator is an option, and in some circumstances a simple rasterizing of an object such as a background can help, but after the gradient is rasterized, Illustrator doesn’t have too many options to work with it. Illustrator doesn’t offer a Noise Filter, but it does have a Grain Effect. And through the effects options window the Grain Effect applied as an overlay can be controlled to simulate the look and effect of a Noise Filter. I’ve found this method of smoothing gradients to be the best solution for improving the smoothness of a gradient while staying in Illustrator, and without altering the color base of the gradient. A raster operation, the Grain Effect, can be so subtle it is virtually undetectable when the image is output. The Blur Effect is another option for smoothing out a gradient. Also a raster operation, Blur interpolates the color pixels in proximity to one and other to give a smoothing appearance to color transitions. Blurs tend to effect the edges of shapes, so while banding can be smoothed out within a shape, the colors surrounding the edges of the shape will be pulled into the shape. To avoid banding, some printers advise illustrators and designers to create their gradient blends in Photoshop and then import them as separate pieces to be placed and masked in Illustrator. This may be ok for one or two blends, but this process can get quite tedious if you have a number of blends you need to produce. The final option I’m going to discuss, which is the option I prefer, is to export the entire Illustrator file to Photoshop. Photoshop displays a wysiwyg, “what you see is what you get”, view of your image and it offers the ultimate image editing control and options to adjust anything that doesn’t look right. Individual blends can be smoothed in a number of different ways, and global solutions for improved output can also be applied. The most effective global solution for banding is to add noise to the file just before final output. A noise level set to 3 is usually enough to smooth out gradients and color transitions without being noticeable in print. I have used this simple method for many years with great success. As another option for smoothing, Photoshop also provides a dithering option when needed. The dithering option works very well with gradients created in Photoshop. custom blends with overlaps. © 2012 Don Arday. Here’s why Photoshop is a better visualization source for gradients. Photoshop displays images in pixels, and each pixel is computed and accurately represented. Illustrator displays an interpretation of an algorithm, and that algorithm is dependent on whatever device is displaying or outputting it. The device computes the transition, so its appearance of a gradient or blend can change between how it appears on a monitor and how it appears on whatever device is used to generate the output of the image. In 1997 Adobe released Postscript Language Level 3. Level 3 included a "smooth shaded gradients" function that interpreted gradients as control points, colorants, and spaces to be filled. Smooth shading has greatly improved the output of blends, but certain shadings are application and output device dependent, so in those cases banding can still occur. Here’s what Adobe says, “Conceptually, a shading determines a color value for each individual point within the area to be painted. In practice, however, the shading may actually be used to compute color values only for some subset of the points in the target area, with the colors of the intervening points determined by interpolation between the ones computed,” (Adobe Systems, “Postscript Language Reference, 3rd Edition” 5. 263). The variables that go into the possible causes of banding are too great for any one universal solution. Like most working methods used to create illustrations and designs, the best solution to a specific problem will come down to a personal work preference.